This gel blush came out with the Rose Romance collection last year, at that point I decided not to get it. However, for some reason I felt like I needed it in my life at this point, so I swapped for it on MUA. It is very similar in colour to BeneTint and some others I own, check them HERE. But, the formula is VERY different, purely because it's a gel and not a liquid. I have been intrigued in gel type blushers that give a glossy finish after I tried the liqui gel stain by Beaute. Liquid blushes tend to be matte, whereas gel or cream formulas tend to be glossy. I would describe the colour as a deep raspberry with a cool red undertone. The consistency feels a bit like a smooth creamy lip balm, it doesn't feel oily and instead feels like it's water based. The colour in the pot looks extremely scary and clownish, but the payoff is actually really sheer and the colour is buildable. It's exactly what I expected. I don't see this lasting on my skin all day unless I top it with powder, but I would rather reapply. Here is 'just a pinch' gel blush applied on my cheeks (I used my fingers), I have also applied Mac's 'Strobe liquid' which enhances the glow on my cheekbone. They are perfect together specially for the Summer! The result is a dewy "fresh faced" and "innocently flushed" look. By the way... I hate you Mac for making such wonderful items Limited edition - repromote please! 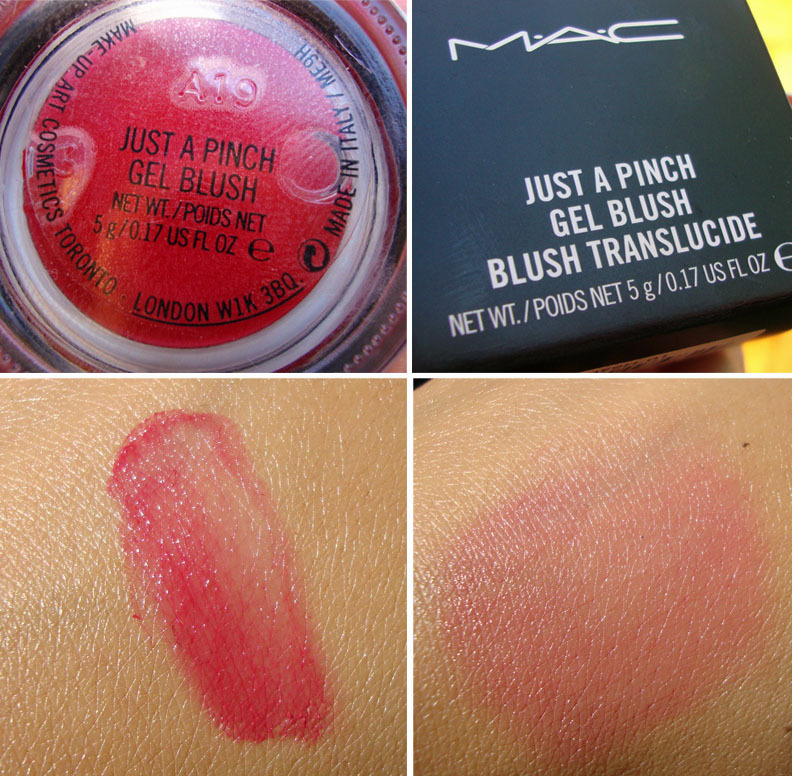 Have you tried this or any other gel blush? ooh, that is gorgeous! especially on your skin tone. i think benetint is much too sheer and i like to have a glow on my cheeks and benetint doesn't achieve that. so this would be a better option for me. mac, please re-promote! until then, thank goodness for swaps, eh? Wow, how beautiful that is on you! @dani@callitbeauty Swaps are amazing :) you said it right, benetint is matte as it's a liquid and this is glossy as it's a gel. very pretty color. Looks great on you. i bet it takes some getting used to. i don't know if i could apply it without looking like a clown. the color looks great on you. I wanna get my hands on this beautiful item :) thanks for showing it to us. I did pick this up last year when it was released, but didn't use it often. Coincidently I started using it daily about a month ago and I am loving it! It is so natural and buildable, and fun to use! I wish MAC would re-release this product with more colors!! This looks terrifying in the pan... but surprisingly beautiful on your skin. I've never been able to make Benetint work - perhaps because it dries fast without leaving a dewy finish - so this would suit me much more. how do u conceal under your eyes? I am a fan of Smashbox Cosmetics O-Glow Intuitive Cheek Color. I love the pink color of this blusher. My cheeks look so natural when I use this product.